I am happy to have had this opportunity to visit here and learn how women have got together to help themselves and through that the residents of the village. A long journey taken and along journey ahead for this. May god bless you. Daniel. NEICORD. We love this place, its very natural, beautiful and green place. We learn about plants and compose, pestisides and many more. We enjoyed a lot. Thanks to all vanlaxmi team. Deepak B. Patel. Very nice place in nature’s lot natural environment and best place to relax. We can know lots of things about plantation and how the use of organic food healthy for us. Very nice place for students to visit and they can get lots of knowledge. We can also be helpful to women power and can develop more strength to them. Thanks a lot. Surely we will vist again. Urvi Kapadia. 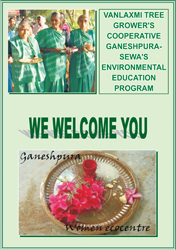 The society was established after getting a 10 acre plot from the Village Panchayat on a 30 year lease in 1986. When the land was received it was covered with shrubbery,thorny cactuses and infested with snakes and other poisonous reptiles. 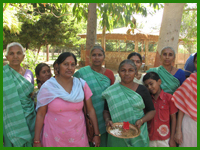 It took the women folk of the village over 3 years (1986-1989) to clear the land, till it and make it arable. The women were reimbursed Rs 13/ day to work on the land as a compensation for their loss of livelihood.The hardship did not end there. The women were subject to a constant ridicule when they went to register their society. Questions were raised about the women’s ability to run a society given their education levels or rather lack of it. Finally the society was registered on 11/7/1991. It is a salute to the self-confidence and perseverance of the women members that the society is at its present form today. The problems did not end there. Registering the society and acquiring the land was just the beginning. After which came the hurdle of fetching water. The women started with fetching water from their villages but that water dried up by the time it was brought to the fields. Digging a rudimentary well did not solve the problem as the parched earth soaked the water. Finally under training and assistance from IPCL, Vadodra they were able to make an artificial plastic pond/well for water storage. This was also not fool-proof as seasonal water could only partially meet the requirements of the farm. SEWA helped them setup a bore well that is 800 ft deep and 8 inch wide that provides them water for their daily use.